← Er det ikke vulkanene da? One of the myths media keep repeating is that global warming entails a warmer and nicer weather. We should soon be able to grow grapes in Northern Siberia. In fact, the IPCC says weather will be more unpredictable, with heavier precipitation than normal several places, drier in other places. Global warming impacts the poles, and the Arctic as well as the Antarctic are losing ice. This inevitably has consequences for global wind patterns. 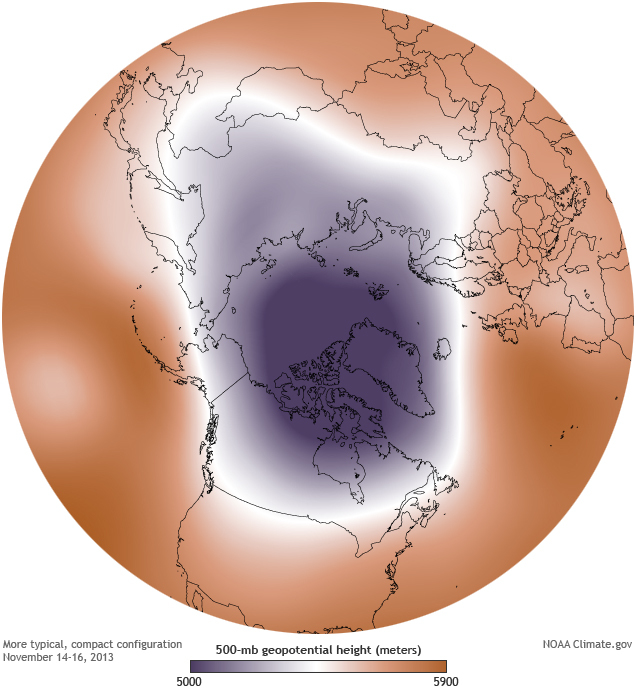 The Polar Vortex is weakened, with further consequences in polar and temperate zones. Global warming is a long-term trend of increasing global average temperature. We still have weather, which causes fluctuations around a rising trend line. Those who live in areas with distinct seasons are well aware of this. A new season brings a much faster change than global warming does. The principle is the same. In the spring, a cold front may cool the weather a week or two. But most people realize, however, that summer is coming. The cooling period is just a skip down for a while before we get back to a rising temperature after the trend line. Average monthly temperatures may vary from one year to the next by 5-6 degrees. This is weather variation. Global average temperature increase is roughly 0,02° C per annum, or almost 0,2° C per decade for the time being. That is the climate trend. This is why you should not confuse weather with climate. When you want to take a closer look at climate trends, you go to the baseline: the Normal, and compare average weather over at least five years to this baseline. Any period shorter than this is weather variations and not climate. –The Normal is calculated for a period of 30 years. NOAA National Climatic Data Center, State of the Climate: Global Analysis for February 2013, published online March 2013, retrieved on March 29, 2013 from http://www.ncdc.noaa.gov/sotc/global/. Note the polarisation between North America and Europe/Siberia in December 2013. Eastern Russia was unusually warm, the USA and Syria unusually cold. This situation lasted well into 2014. Worrying is a distinct cooling just south of Greenland. This is connected with extra large supplies of fresh water from Greenland’s melting glaciers. This map depicts average temperature deviations over the year 2015. An ever cooler sea area at the southern tip of Greenland indicates a disturbance of the thermohaline circulation and might be a symptom of a weakening of the arm of the Gulf Stream running north towards Norway and the Arctic Ocean. Note that these maps give an overview of the temperature deviations compared to the 30-year normal. The map shows the difference between the current temperature and the long-term average temperature. Red fields are areas warmer than average, blue fields are colder. There are more red than blue fields. It is the same almost every month: patterns of red and blue may shift, but it is almost always more red than blue. The planet warms up. If you are in a blue zone this month, it is easy to say: “It’s cold outside! Global warming is nonsense “. But then you are staring at the weather, and do not see climate. Our atmosphere is a complex, dynamic system. In recent years, a new phenomenon has created unexpected temperature effects. Generally, winds around the North Pole keep the cold air in place around the polar areas. 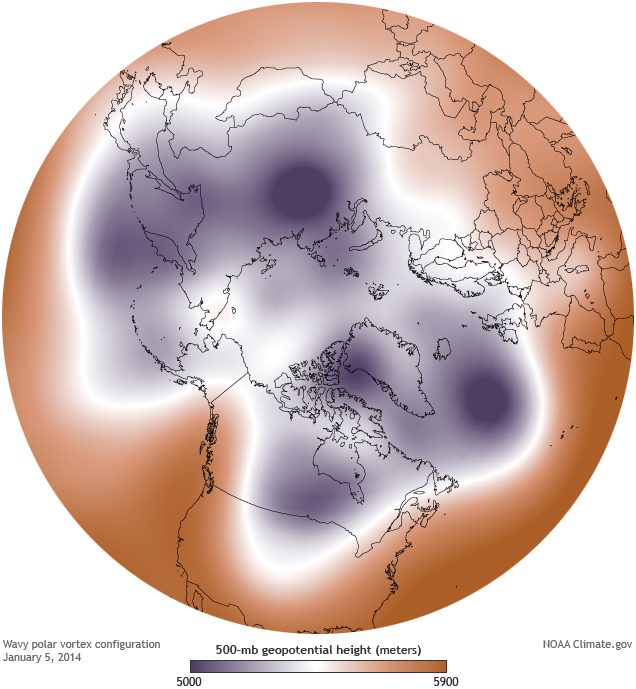 A new pattern called the Arctic dipole, has emerged. This is probably due to the recent massive loss of sea ice in the Arctic Ocean. When the system enters the Arctic dipole mode, warm air from temperate zones blows towards the Arctic, while cold polar air go south to replace it. This exchange of air masses creates the ironic situation that areas in the north may experience particularly warm periods, while areas further south, especially eastern North America and Western Europe, may have episodes of unusually cold winter. “The decline in sea ice and snow cover has slowed the west-to-easterly component of the jet stream, thereby enhancing the north-to-south waviness of the jet, which leads to the creation of more stagnant or “blocked” weather patterns. In addition, the new study found an association between sea ice and snow cover decline and a northward shift in the jet stream, which allows more warm air to move into the U.S. and Europe during the summer. Paradoxically, other studies, including work by the same team of researchers, has shown that Arctic warming can actually enhance cold weather extremes in the U.S. and Europe during the winter” . It is important to remember that global warming means more evaporation from the oceans to the air. More moisture in the air means more precipitation. As long as the temperature remains below 0 ° C, this precipitation will be coming as snow. In North Western Europe and the North East of the USA, this means global warming causes more rain and more snow but gradually shorter winters. Periods of heavy snow must be expected in the Nordic countries and parts of North America for several years ahead. The winter periods will become more erratic, with unusual mild periods in between cold periods. There will be more warm records than cold records. More icy roads for longer periods are likely. Rising temperatures and a warmer Gulf stream give melting sea ice in the Arctic, especially in summer. When satellite measurements began in 1979, summer sea ice covered about seven million square kilometers, an area almost as large as Australia. In September 2012, the summer ice at its lowest ever, only 3.4 million square kilometers. Sea ice cover will of course vary with weather from year to year, but the trend is clear: Arctic sea ice volume goes down, and summer sea ice cover calculated over decades will clearly diminish drastically. The mechanism is something like this: Remove the reflective ice and you have a dark sea that absorbs solar radiation, which in turn enhances melting, and so on. As a growing part of the Arctic Ocean becomes ice-free, relatively warm surface water spread over an increasingly larger area. This extra heat is gradually released into the atmosphere in the fall. This warm, moist air increases the air pressure and humidity in the Arctic, which reduces the temperature difference at lower latitudes. This means that the polar vortex, a powerful circular air, which keeps the Arctic air in place at the North Pole, begins to fade. This in turn leads to damp, cold air seeking southward, taking snow and colder weather to North America and Europe up to several weeks on end. Note: In winter time, in cold periods, the sea ice may cover unusually large areas because of the extra amount of surface freshwater from the melting glaciers on Greenland, and extra surface freshwater from the Russian and Canadian rivers. Global warming gives more precipitation, and increases the amount of water in the northbound rivers. However, this is thin winter ice. The total volume of the Arctic sea ice is going down dramatically. More icebergs in the ocean on the other hand, indicate warmer weather, because icebergs come from calving land based glaciers. The key is to look at the temperature of the entire planet over time. When some areas are unusually cold, this does not mean that the planet has cooled. This means that air masses have changed direction, presumably as a result of sea ice loss due to man-made warming. Even under extreme Arctic dipole periods, there are more areas that are warmer than normal, than regions that are colder than usual. Two or three degrees more – does it matter? This entry was posted in Denialism, Environment and tagged Arctic dipole, circumpolar winds, climate variations, Climatic natural variations, Global warming and cold winter, Jet winds, melting Arctic ice, Polar vortex, temperature anomalies, temperature deviations, weather vs climate, wetter and drier climates. Bookmark the permalink.